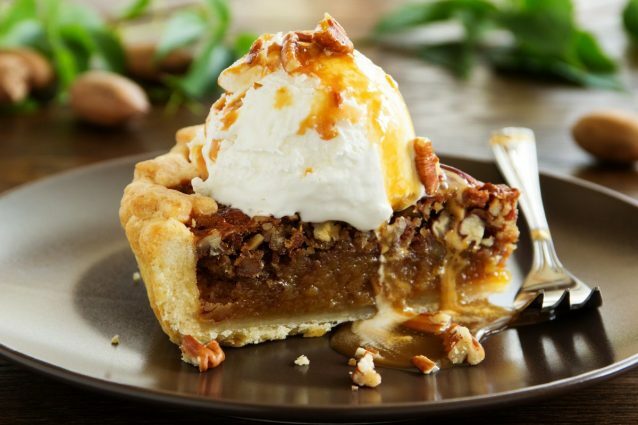 Full of warm nuts and baked into a flaky pie crust, pecan pie is the perfect cold weather dessert. The key to a great pecan pie is not to overload it with sugar but still keep it just sweet enough- a delicate balance for sure! 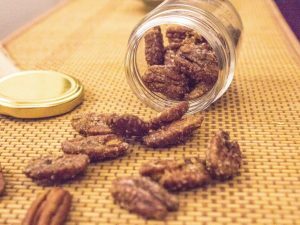 While many recipes for pecan pie will use whole pecan halves, chopping he pecans into large pieces makes the pie easier to eat and packs more pecans into every bite. However, if you prefer the look of whole pecans, no problem! This recipe will still serve you well. In a medium sized bowl, mix together the sugar, cornstarch, corn syrup and softened butter until the butter is fully blended into the sugar mix. Add the water and vanilla to the mix and stir together. Add the eggs and salt and stir again. Be careful not to overly whip the eggs, you just want to incorporate them to make a smooth batter. Add the pecans to the batter and gently mix in. Pour the pecan pie batter into an unbaked pie crust. -You can make this full recipe in a stand mixer as well but it is very easy to do by hand. -Add 1/2 cup of chocolate chips for a chocolatey pecan pie. -Serve the pie warm with a scoop of vanilla ice cream for a perfect fall dessert!